The Pro-Chancellor and Chairman, Governing Council of the University, Dr. (Barr.) Aboki Zhawa, has lend credence to the fact that FUNAAB remains one of the best universities that he had seen from his inspection, interactions and meetings with diverse interests in the University. The Pro-Chancellor further gave his pass-mark in view of the fact that the University is situated in Ogun State; a state he said had produced many scholars, intellectuals and successful personalities in various fields of human endeavour such as the Nobel Laureate, Professor Wole Soyinka, foremost industrialist and philanthropist, late Chief Moshood Abiola and the elder statesman, Chief Olusegun Obasanjo, among others. At the special interactive meeting with the members of the University Senate, the Pro-Chancellor stated that Senate was like the legislative arm of the University, which is meant to advise the Governing Council, saying the co-operation, support and synergy between Council and Senate was sacrosanct for the betterment of the system, as he called on the members of the University community with diverse opinions to come forward and share them. While informing the Senate that the 6th Governing Council would operate with rules and regulations, devoid of sentiments, bias and prejudices, he advised anyone with germane issues to approach the Council, with solutions. The Pro-Chancellor called for support and recognition of excellence, intelligence and hardwork within the system because everybody within the University community needs each other to succeed as no one is a repository of knowledge. He used the occasion to express his personal displeasure over the policy to transfer Universities of Agriculture, from under the purview of the Federal Ministry of Education to the Federal Ministry of Agriculture, saying this move would be counter-productive and may end up leading to policy-summersault. He, however, confirmed that FUNAAB was still under the supervision of the Federal Ministry of Education. Dr. Zhawa equally eulogised the Acting Vice-Chancellor, Professor Ololade Enikuomehin, saying that he was a wonderful man, who was intellectually prepared for the job. He added that the Governing Council was looking forward to working with him during his short stay in office. The Acting Vice-Chancellor, Professor Ololade Enikuomehin, said the University believed in the capacity and capability of the new Governing Council to deliver, promising that the Senate would work with the Council members to achieve their lofty objectives. In their separate remarks, Professor Clement Eromosele of the Department of Chemistry, College of Physical Sciences (COLPHYS) and a former Deputy Vice-Chancellor (Academic) of the University, disclosed that the Pro-Chancellor was a man of wisdom, who would provide quality leadership in finding lasting solutions to the challenges confronting the University. On his part, Professor Okanlawon Onagbesan, Director, Centre of Excellence in Agricultural Development and Sustainable Environment (CEADESE) of the University, reminded Governing Council members that there was a lot of work to be done. He said what the University needed now was reconciliation and moving forward. Professor Kolawole Adebayo, Director, Grants Management of the University, added that the Council should work more on getting funds for the University; from local and foreign donors. Professor Samuel Otubusin of the Department of Aquaculture and Fisheries Management, College of Environmental Resources Management (COLERM), said the Council members were coming on board at the right time to manage the University better. 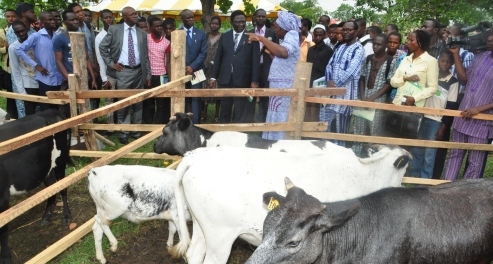 Professor Peter Okuneye of the Department of Agricultural Economics and Farm Management, College of Agricultural Management and Rural Development (COLAMRUD), advocated for the retention of College of Management Sciences (COLMAS), which was mapped out for scrapping following recent pronouncement by the Federal Government. For Professor Isaac Ayelaagbe of the Department of Horticulture, College of Plant Science and Crop Production (COLPLANT), creating an enabling environment would bring about development, urging the Council to consider adopting the Public Private Partnership (PPP) model, as a way of moving the University forward. Professor Babatunde Adewumi of the Department of Food Engineering, College of Engineering (COLENG), said the speech of the Pro-Chancellor had shown that peace and tranquility would reign in the University. Similarly, the Pro-Chancellor has charged members of the University community to come up with practical solutions and should not bring up more problems. He stated this at the special meeting of the Congregation that was held in his honour. According to him, the Governing Council and Management would be interacting with members of the University community, from time-to-time. The Pro-Chancellor restated that everybody in the University would be treated according to the rules guiding the day-to-day administration of the University. Responding, the Acting Vice-Chancellor appreciated the Pro-Chancellor and members of Council, saying that the entire University community was confident that they would take the University to the next level. At the University Library, the Pro-Chancellor charged Management, to as much as possible, decentralise library activities, stressed that Colleges should have functional libraries such that a reader would only resort to the main library, if he/she is unable to get the needed publications at the college library. Dr. Zhawa reiterated the need for a 4-year plan for the library’s development, which he said would promote electronic library.